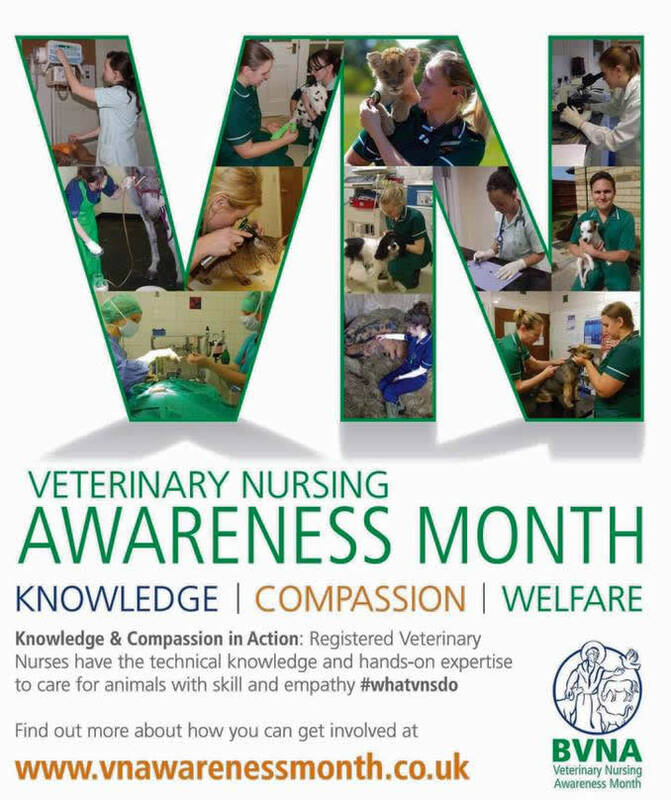 The 1st May marks the start of the BVNA’s Veterinary Nurse Awareness Month! Veterinary nurses are a vital part in the care of your pets and we feel it is important to spread awareness about what they do. Very much like human nurses, they not only care for your pets, they also take part in X-ray positioning, anaesthetic monitoring, giving medications, conducting nursing consults among many many other duties. What do Vet Nurses do? We often find that people can be surprised about the variety of work that Vet Nurses do, so we thought we would take this opportunity to spread awareness and highlight what an incredible job they do every day! 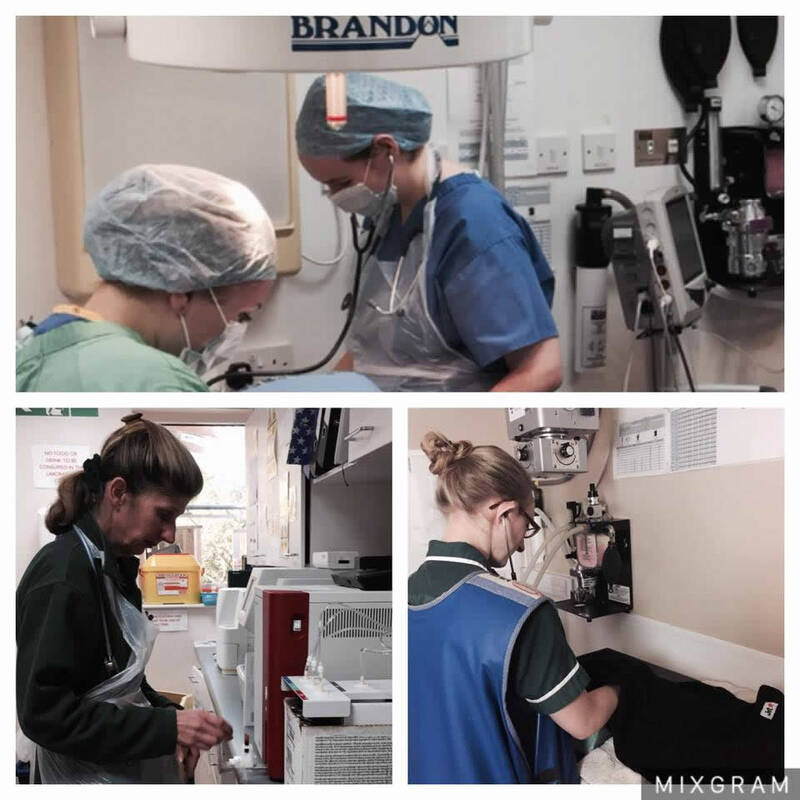 Here are a few of our nurses carrying out a number of duties, including monitoring an anaesthetic during an operation, by Kim, making sure the patient stays asleep, and yet is safe whilst under anaesthesia. We also have one of our nurses, Dannii, recovering a patient after a General Anaesthetic, and Nurse Mikaela, not only monitoring an anaesthetic during a dental, but also teaching and mentoring one of our students, Amber. There a few different ways in which a person can train to become a Veterinary Nurse. Completing a Degree through University is one option, either doing a few days a week in practice or completing block placements. These courses tend to be 3-4 years long. Another option is doing a Diploma through college. This course takes around 2 years, and you spend 4 days a week in practice and 1 day at college. 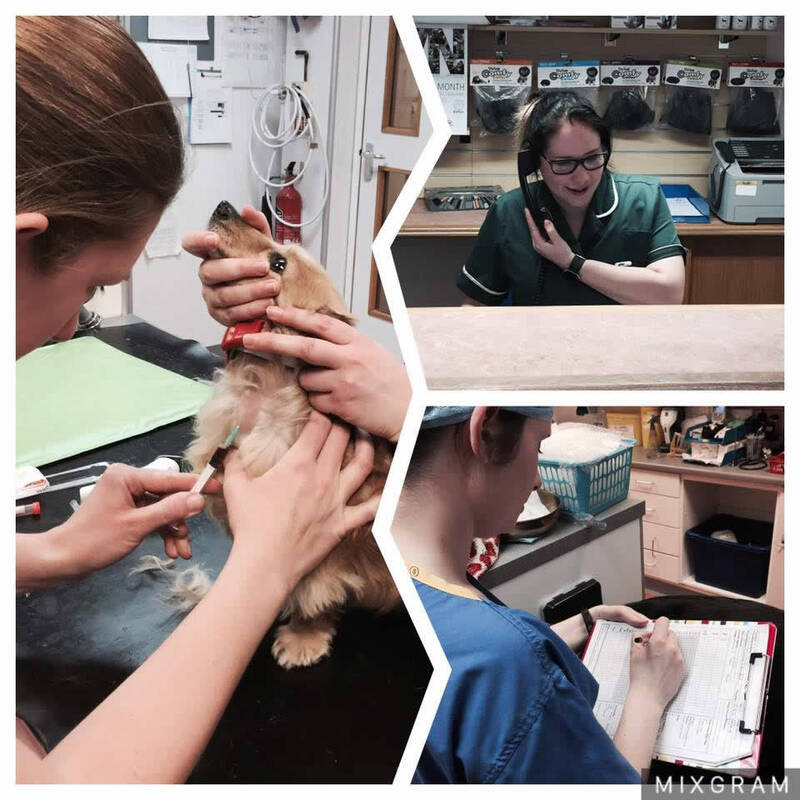 Becoming a Veterinary Nurse takes total dedication – not only are there multiple exams to sit, such as anatomy and physiology, law and ethics and first aid, there’s a fair amount of assignment writing too! Trainee nurses also have to complete the Nursing Progress Log (NPL). This is a (very) long list of tasks to complete, such as cleaning cages, taking blood samples, X-ray positioning and performing anaesthetics, among many others. 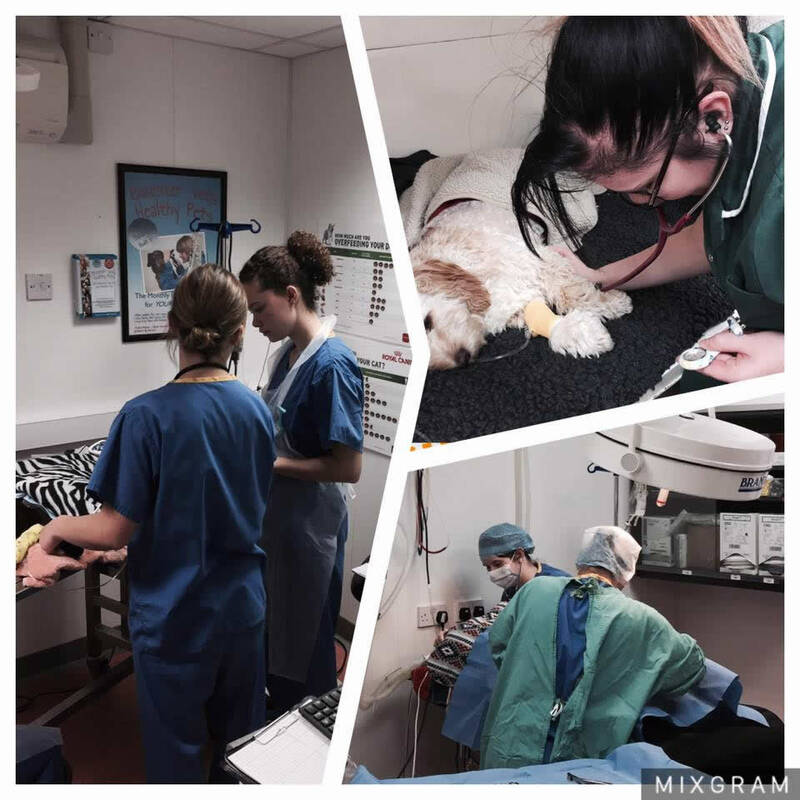 As well as this, nurses also need to take ‘OSCES’ – these are practical tasks which the nurse must be able to complete before becoming a Qualified Veterinary Nurse. Although this sounds very daunting, becoming a Veterinary Nurse is very rewarding and a profession we are very proud of! 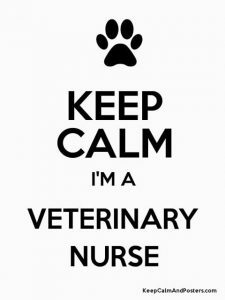 If you have any questions about becoming a Veterinary Nurse, please do let us know, we’ll be happy to help! Pictured are a few photos of our Nurses at work. Leanne is performing an anaesthetic, Debs is running some bloods and Carrie is positioning a patient for X-RAYS. Once a Nurse has qualified they must go onto the ‘Register’. 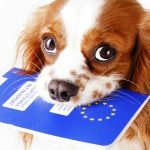 This is a requirement by the RCVS (Royal College of Veterinary Surgeons) and means nurses are held to the RCVS code of conduct and must keep up to date in new ideas, knowledge and treatment. It is compulsory that every Nurse takes part in 45 hours of CPD over a 3 year period for the whole of their career. This means they are constantly learning new ideas to help treat your pet in the best way possible. Not only this, but Registered Nurses can choose to do further studies and gain certificates in certain fields. Meaning more exams! There are also certificates in things such as Anaesthesia and Wound Care. Pictured is a photo of Head Nurse Louise, taking a blood sample, Dannii manning the reception desk and Kim, completing an anaesthetic record. Emergency care is one of the most important things a nurse can do. Whether it’s monitoring a patient having a blood transfusion, managing pain in a fracture patient, caring for and monitoring a patient post emergency surgery, such as a splenectomy, or caring for newborn kittens/puppies. 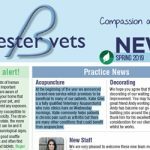 There is always a nurse on site at Bicester Vets, even at night, and they are a very vital part in caring for your pet. Nurses will constantly monitor emergency patients, monitoring heart rates, blood pressure, circulation, and other vital parameters. If the nurse is concerned or a change is noted in the patients condition, the vet will be notified and further action taken. Nurses will give the required medications, monitor fluid therapy, prepare emergency equipment, feed a patient according to their needs, assess and control body temperature, monitor vitals and will always give much needed TLC. Among many many other duties! Not only this, but Nurses man the out of hours phone line and are there to offer support and advice to worried owners. 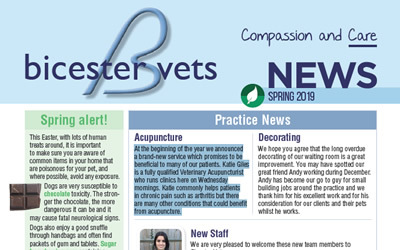 Please remember that Bicester Vets is always available for emergencies! If you are ever worried about your pet out of hours, please don’t hesitate to call and speak to one of our nurses. One of the many jobs of Registered Veterinary Nurses are Nursing Consults. 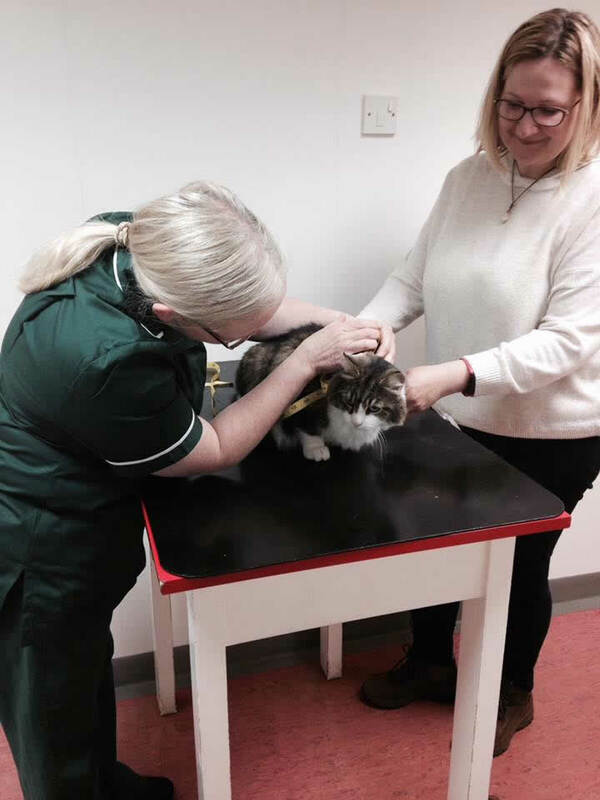 We run Nursing Consults because we want to make sure you can ask all the questions you have, put your mind at ease, help with treatments or give general advice about your pets. 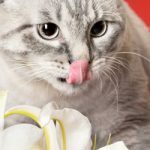 At Bicester Vets, we offer Adolescent Checks, these are for puppies and kittens aged 4,5,6,9 and 12 months. 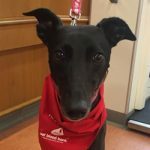 This is a perfect chance for owners to ask questions regarding weight, food, neutering, behaviour, socialisation and any other queries you may have. 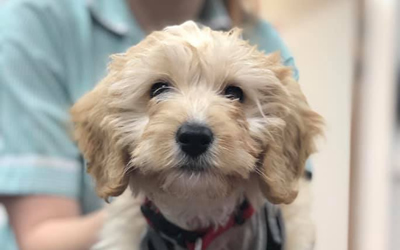 Not only this but it helps your pets get the much needed socialisation they need at such a young age and helps them feel comfortable being checked over and being in the stressful environment of the hospital. 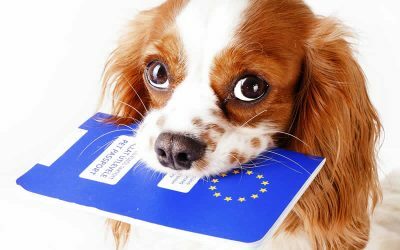 We also offer post op checks. These are for patients that have been neutered and need their wounds checked. 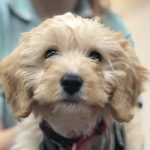 These Consults allow the nurse to check over your pets, making sure everything has gone well, the wound is healing and offers owners the chance to ask any post neutering questions they may have. Weight checks are also offered. These are for pets that are either over or under weight. Nurses are able to support you through either weight loss or weight gain and are able to sort out a feeding regime for you. We have had a lot of success with these and have seen many patients achieve their ideal weight with the dedication of both owners and nurses. We also do Bunny Checks. This is a general check over and owners can get plenty of advice from Nurses on how to keep their bunnies healthy and happy! And last but not least, nurses can help to Medicate your pets. If you are having trouble tableting or giving any medications, nurses can help. They can either do this for you, or give you tricks and tips so you are able and feel more confident doing it at home. If you have any questions or queries and feel a nurse can help, please give us a call and we can see what we can do. They were both so kind and caring and made a truly difficult and painful time much better than I could have hoped – peaceful and calm.